Today on the TI home page we’ve posted a video that succinctly summarizes the skills taught in our latest self-help tool – the Self-Coached Workshop for Perpetual Motion Freestyle, which begins shipping next week. 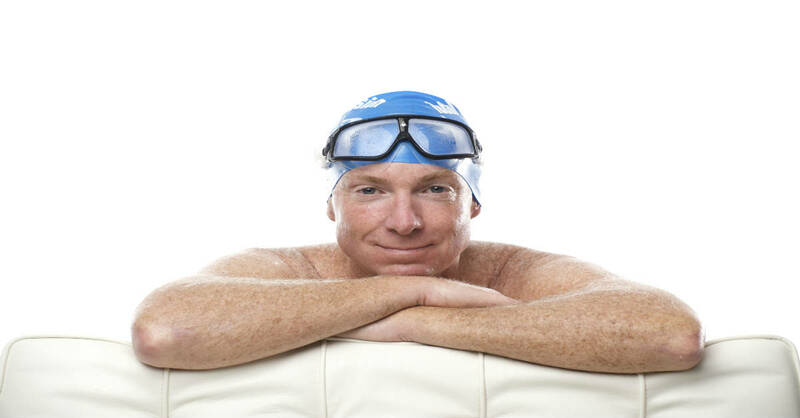 During that period, I’ll examine the main problems human swimmers face, and the solutions that help you swim freestyle (and other strokes) with Kaizen ease and body control. Have you ever seen a fish that wasn’t horizontal while swimming? Fish and aquatic mammals are naturally designed for aquatic (i.e. horizontal) balance. Humans, as terrestrial mammals, are naturally designed for land (i.e. vertical) balance. Most of us recognize that the cost of imbalance in the water is more drag and fatigue, less speed. But the true cost is actually far greater. Usually, we’re not in real danger. But who can think clearly when it feels like your survival depends on churning furiously until you reach safety. The reason we feel threatened is a simple matter of buoyancy and gravity. Buoyancy pushes our air-carrying lungs up, while gravity pulls our dense lower body down. That has costs far beyond what most people realize. 1. A sagging lower body increases drag considerably. 2. The resulting survival strokes churn up a froth of bubbles—and can easily exhaust you within 30 seconds–but are utterly ineffective for propulsion. 3. However the costs in mental energy may be greatest of all, and have rarely been acknowledged. Though the brain makes up just 2 percent of the body’s weight, it consumes 20 percent of its energy. Normally about 50 percent of the brain’s energy consumption goes to managing balance. But when the brain senses imbalance–and particularly when it thinks you’re sinking–it goes into critical mode and nearly 100 percent of its energy is consumed with trying to fix that. Until you fix ‘that sinking feeling,’ you have no chance of becoming comfortable or efficient. And with that amount of energy waste, it makes no sense at all to try to ‘tough it out.’ Before tackling even the most rudimentary skills, we need to send the brain unambiguous signals that we’ve got control of body position. That frees up the mental energy to focus on skills that require some degree of calm focus. That’s why all TI learning sequences start by teaching comfort and body control–as is the case with Lesson One of the Self-Coached Workshop. In terms of stroke mechanics, Lesson One exercises teach you to position head, arms and legs in ways you’ll maintain in every drill (and stroke) that follows. But more importantly–by teaching you to relax into weightlessness–it frees you from the evolutionary legacy of being a land-dwelling species. Like all terrestial mammals, we’re wired by evolution to keep the head above the surface, in a ‘safe’ place. The head-lifting instinct just makes our balance problem worse. And our survival instincts also interpret gravity–at least in water–as a threat to well-being. Bypassing that instinct and replacing it with an instinct to cooperate with gravity is a difficult, but utterly necessary, step. Though Lesson 1 drills appear simple, they are essential in replacing an inborn reflex with a calmly considered choice. They also free up the considerable mental energy required for skill-acquisition. For this reason, we recommend repeating Superman Glide as much as necessary to imprint a sense of support and stability. We also recommend that you “tune up” for more advanced skills by starting reps with a few moments of Superman Glide, while working on more advanced lessons and skills. Newer swimmers, anyone who still feels their legs are sinking, or find it difficult to relax the kick will benefit hugely from staying with Lesson One longer. All Lesson One exercises are Tuneups, designed for practice in short intervals–usually 10 yards or less. Even after progressing to Lesson Two and beyond, use one or more of these– particularly Superman Glide–as tuneups as you begin a practice session . . . or anytime you feel yourself becoming tense or working too hard. Repeat Superman Glide or Laser Lead Flutter until you feel weightless and relaxed again, then maintain that as you resume practice. Terry I like this post and especially paragraph one = The “Energy Sink”. Of the hundreds of people who claim to be ‘sinkers’ I have only met one who could sink to the bottom of the pool with full lungs and I think he can float ok in salt water. I agree with what you say about us being ‘vertical mammals’. We have ‘up-down’ spine alignment whereas virtually all animals (excepting the Aussie kangaroo which ‘pivots’) have a horizontal spine. WE LIKE TO SEE WHERE WE ARE GOING!!! Thanks Terry for the mental stimulus! This is very true. I have improved my swimming ability and comfort by becoming comfortable and relaxed in the water. Niall Welcome to the US. Have you arrived yet? You can find workshop opportunities at the Learn TI link on our web site. I am a rotten sinker and in the middle of one of your drills spontaneously sunk to the bottom of the pool… and I was at the deep end too! I took on board what you said about not fighting the water so I just relaxed and let it happen. It was a very strange feeling. That said, after two sessions of balance drills (front, back and side) my balance has improved heaps. Your drills really helped me sense how much difference my head position makes to my hips and feet. For us sinkers, balance in the water is something we have to learn but with the right drills it is a skill we can master.